RTG – Compact Block & Bleed Valve for Gauge Services – Fitting Source Inc. Isolation needle valve with integral venting facility (option -V). Valve shown Part No. N4NS-1M-V. 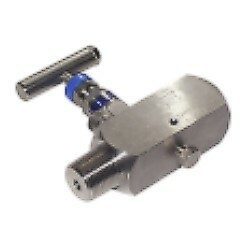 Adapted from the precision made ‘N’ series, single isolation hand valve utilising metal to metal seat and body to bonnet connection for superior, bubble tight sealing capabilities at both extreme pressures and temperatures. The “N” series also offers non-rotating hardened tip for extended service life. The unique anti-vibration cam locking device at the body bonnet connection is for extra safety. Working pressures are 6,000 psi and 10,000 psi. Maximum working temperature up to 230°C and up to 570°C with GP option at reduced pressure. Manufactured in 316 S11 stainless steel as standard. Certain exotic materials such as Duplex, Hastalloy, inconel, Ziconium, Ali-Bronze or Titanium are also available.